Posted July 5, 2017 10:09 pm by Maria K.
One recent sunny morning, I decided to ride my bike around my neighbourhood to discover how the #holyroodbenchproject had turned out (click here for the original moodling on the subject). And I have to say it was a wonderful ride because of the anticipation I felt with every corner I turned. Coming across a bench I hadn’t yet seen was like finding an unexpected present under the tree on Christmas morning. 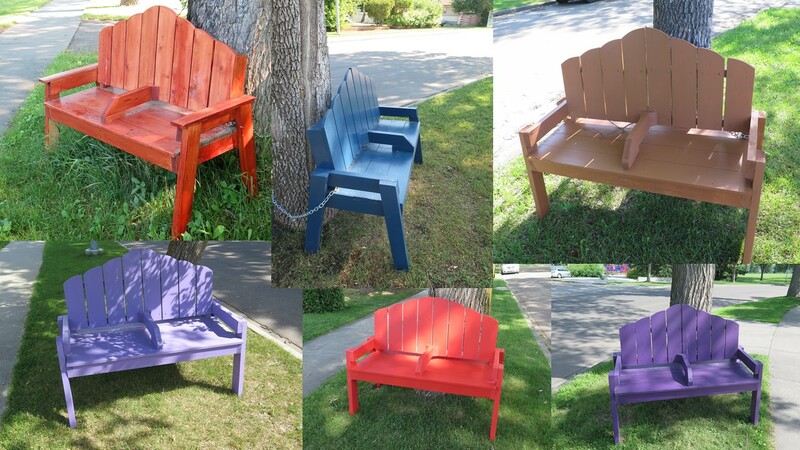 Thanks to all the wonderful woodworkers at SEESA, and to my neighbours who took responsibility for giving these benches homes — and some creative paint jobs! spawned the idea for the #holyroodbenchproject. or at least that’s how I see it. See the ducks? with a ziplock bag of chalk included. and see the beloved pets in the trees? The bench outside our house appears on my original moodling… and counting it plus all of these, I’m still a couple short of the 20 that were built for the #holyroodbenchproject. I know that the SEESA seniors have had quite a few extra orders, so if you would like a neighbourly bench of your own, they’re now selling them for $100, a great deal. A friend of mine bought two, one for her boulevard and one for her children’s school. If you have a bench that I missed in this moodling, let me know, and I’d be happy to come take its picture too. I’ve never ridden my entire neighbourhood on my bike before, and I found that tracking down benches made it even more enjoyable. And if you’re looking for a walkable neighbourhood with big trees and shady benches for rest, come visit us in Holyrood.